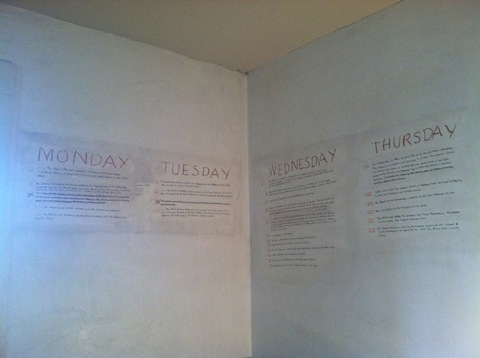 Every great novel—or at least every finished novel—needs a plan. I remember well a James Joyce course I took in college, taught by a belligerent Irishman who began the first class meeting by slamming his decades-old copy of Ulysses on the table, sending clouds of dust and Post-It notes around his ears and shouting, “This is my Bible!” He proceeded over the next few months to unravel the dark mysteries of Joyce’s design, with chart after chart of floral symbology, musical motifs, Dante allusions, mythic and Catholic rewritings, and Dublin city maps. Needless to say I was intimidated. But not every author requires the god-like foresight of Joyce. 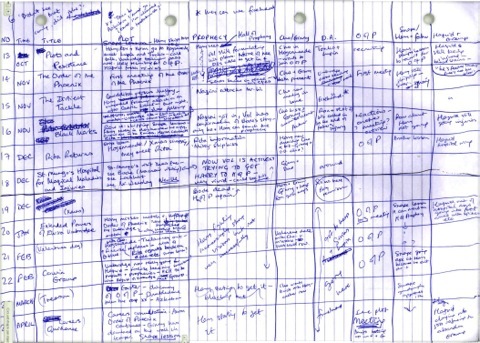 Witness, for instance, J.K. Rowling’s spreadsheet for Harry Potter and the Order of the Phoenix (top), hand-drawn on lined notebook paper. Fine, Rowling’s no Joyce, but no one can say her method didn’t yield impressive results. For a more canonically literary example, see William Faulkner’s plan for A Fable (above). Faulkner famously outlined his fiction on the walls of his Rowan Oaks study, in-between bottles of bourbon. Flavorwire has compiled a number of author outlines, from Joseph Heller's dense, intricate grid design for Catch-22 to Jennifer Egan's storyboards for "Black Box" and Norman Mailer's medieval manuscript of a plan for Harlot's Ghost. Each outline betrays a little of the author's mind at work. These are fantastic examples of what I consider to be “mind maps”. What YOU consider to be “mind maps”…?nGenius. STRUTH!!! – no wonder I’m never going to be able to write fiction! I have read most writers do use a form of note taking when writing. I am one of the few who visualizes a concept from memory. This includes towns, citizens, roadways where the main characters live, friends and co workers. I draw pictures of my characters, I draw maps and write lots of notes. Most everything we create gives a bit of insight into our minds, not just our planning pieces…. our final pieces too. And not just writing, but arts, crafts… even the dreaded business letter. We’re human, we touch everything.